Italy has always had a proud history of providing some great progressive rock bands; PFM, The New Trolls and Le Orme being prime examples from the seventies. It appears that this tradition continues into the twenty-first century with Perspectives of a Circle, a group of five young men from Rome whose love of the progressive rock genre has helped them to come up with clear musical ideas for this, their debut album. The history of the band starts back in 2009 when Lorenzo Politi and Lorenzo Corsi met and began to discuss music, proposing to work on songs together. They then met bass player Maciet Bodniak, who later left for logistical reason. After the use of two different names for their band, Winged Hussars and Kingscross, the name was changed for the last time to Perspectives of a Circle and the band found a settled line up with the addition of Francesco Marchetti (drums, vocals), Vittorio Pagano (bass) and Tommaso Calemme (keyboards, vocals). 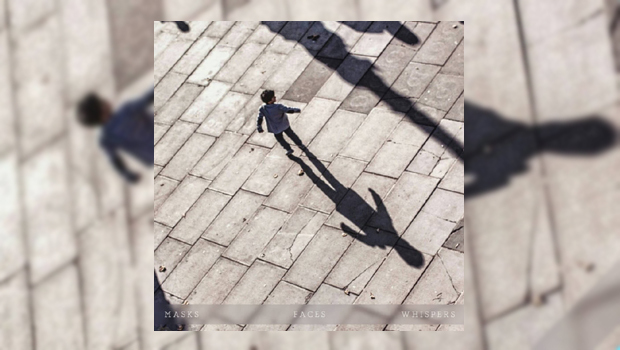 Masks, Faces, Whispers is an album full of creative ideas, fine detail and some great vocal harmonies, threaded through with acoustic parts and occasional heavier musical styles. Their youthfulness gives the songs a vibrant energy and they play with skill and confidence. They have taken the “classic” sounds of the progressive music scene’s finest and woven them into a modern sound, in some ways reminiscent of what Steven Wilson has done quite successfully. There are influences to my ears from Camel, a little Gentle Giant, touches of Pink Floyd, and some Yes-like vocal harmonies. The album, with a title taken from the names of three of the tracks, is sung in English, except for La Scala Che Shende in which they use their native Italian. Waves Rolling Down The Hills, Part One opens a three song cycle, a keyboard orientated song which delivers a great guitar solo before the song finishes with piano. Interlude (No One) separates parts One and Two, a short instrumental passage which has an almost medieval feel towards the end. Keyboards again dominate Waves Rolling Down The Hills, Part Two before the entry of guitar just after three minutes which increases the drive of the song, which ends with more flourishing keyboards. The album ends with its longest track, Fallen Bridge/100.000, where the band appear to give a further demonstration of what has gone before; layered vocals and harmonies, atmospheric changes leading to rapid interplay between all the instruments. The keyboards at the start have a slight Marillion feel at times, a short drum solo around four minutes in gives way to the guitar as the song develops a sharper edge, flute then piano softening things again. The ending is the short acoustic guitar piece that is 100.000. Perspectives of a Circle have created an excellent debut, full of ideas which sound vibrant and fresh; the songs have regular changes to the melody, often linked to the instruments being used at the time. All this makes for a very interesting listen; I for one have enjoyed it and look forward to hearing where they go from here.